The first step in obtaining your home building permits are either a phone call or a visit to the building inspector's office... and this is the time to make that first impression count...and that is why I decided to drop by there office in person. Use this opportunity to ask questions...like what is required for additional information,....permits, certificates etc.,..before you can obtain your building permit...and which ones should you do first. A good relationship with your building inspector will make the process of obtaining your permit... go a lot smoother. Your building inspector can be the thorn in your side.. or they can be a friend with helpful advice. So don't hesitate to ask there advice...they will be impressed that you value their opinion. It may differ a little bit.. depending on where you live.. but here are the things that I had with me when I went for my permit. A copy of my house plans.. showing a cross sectional view of footings, foundation, floor, outside walls, roof etc. A copy of certificate of title. A copy of your land percolation test or septic approval. 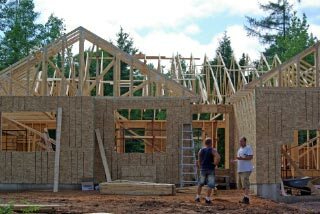 The other thing you will need is your wallet... the home building permits are the biggest,...in terms of money lay out,...of all your permits... it will generally run you 1% of the cost to build your home. This cost may vary depending on where you live. If a driveway culvert,.. is needed,.. then this probably will have to be done first. The permit for the culvert and land breaking permit can be arranged through your highway dept or city office. There are other permits needed...relax..they are small in price compared to the one for your home. Other permits and or inspectors required are plumbing, electrical,health and your bank or mortgage company will normally send someone out before they advance any moneys. The home building permits process can be the most frustrating part of the whole house building venture...it was for me...but it does not have to be...if you make sure of what comes first... and your building inspector can tell you which steps to take first. Take your time and do each step in order...Rome wasn't built in a day... stick with it you will survive...I did. Just click on the links below for additional information.